Did Marvel Sneak Silver Surfer Into Infinity War? 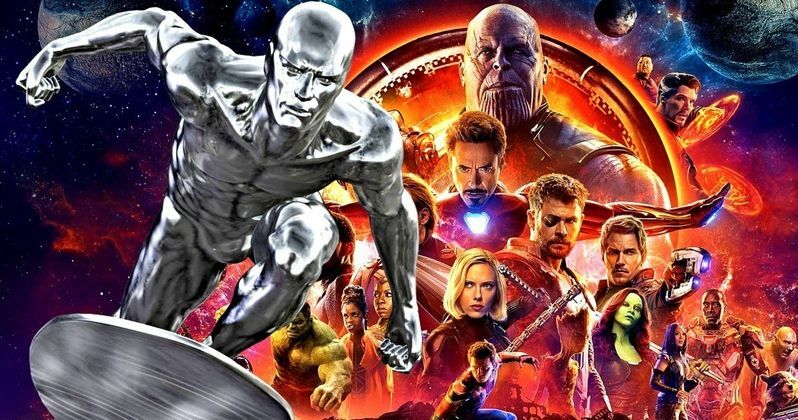 Did Marvel sneak Silver Surfer into Infinity War? Marvel's upcoming Avengers movie is going to be the culmination of 10 years worth of interconnected MCU moviemaking. There are surely going to be quite a few surprises in store, but by definition, surprises are supposed to be exactly that. We're not supposed to know anything about them until we see them. However, a new, peculiar cast listing suggests that Silver Surfer is in Infinity War. If so, the beans may have been spilled on this one. This surprising news, which should be regarded as rumor for now, comes to us courtesy of review aggregation site Metacritic. On their page for Avengers: Infinity War, there's a full, detailed cast list, with each cast member's character listed next to their name. On that list is actor Curt Clendenin, who is, according to Metacritic, playing none other than Silver Surfer. He's a relatively unknown actor, at least when it comes to playing a role this huge, but he does have 60 credits to his name on IMDB. So he's been working for quite some time, for whatever that may be worth. There's a lot to dig into with this. For one, if Silver Surfer is somehow going to pop up in Infinity War, Marvel Studios would almost certainly want to keep it a secret. Especially considering that, until the Disney/Fox merger is actually approved by regulating bodies, Fox is still in control of the character, which is why he appeared in the unfortunate and terrible Fantastic Four: Rise of the Silver Surfer. Not only that, but James Gunn stated in a Facebook Q&A last month that no X-Men characters, "or anyone else like that" will be in Avengers 3 or Avengers 4. "There is no merge yet between Disney and Fox, it does not exist yet. Hopefully, it will exist. Hopefully, they will work it out. But, it doesn't exist. You will not see X-Men or anyone else like that in Infinity Wars, Avengers 3 or Avengers 4, because those movies have been shot." Silver Surfer falls under the "anyone else like that" umbrella. Still, Marvel is known to throw us a curveball every once in a while and Silver Surfer is a character that fans would love to see in the MCU. And, not for nothing, but he factors into the Infinity Gauntlet storyline in the world of Marvel Comics. So his inclusion could absolutely be justified from a story perspective, even though Infinity War isn't really based on any one specific Marvel Comics storyline. Kevin Feige has repeatedly expressed that Marvel Studios' focus is getting through Avengers 4. Until the Disney/Fox deal is ultimately approved, he's not focused on what the MCU can do with the X-Men and Fantastic Four. He hasn't specifically discussed Silver Surfer, but we can safely assume his statements include the classic cosmic Marvel character as well. Still, wouldn't Silver Surfer showing up in a post-credits scene, or something along those lines, be pretty cool? Just don't get your hopes up too high, Silver Surfer fans. This news comes to us courtesy of Metacritic. Marvel Already Has Plans for Fox Characters Galactus and Silver Surfer? What's the Truth Behind Those Infinity War Silver Surfer Rumors?